We’d love your help. Let us know what’s wrong with this preview of The Avenger by Don Jacobson. "Bennet looked at his wife’s swollen lips, softly bruised from several deeply loving kisses, and her flushed complexion, as alluring when gracing the countenance of a woman of four-and-forty as that of a girl of nine-and-ten. He was one of the lucky few to have fallen in love with the same woman at both ages. The elder had, after all, learned all that the younger could onl "Bennet looked at his wife’s swollen lips, softly bruised from several deeply loving kisses, and her flushed complexion, as alluring when gracing the countenance of a woman of four-and-forty as that of a girl of nine-and-ten. He was one of the lucky few to have fallen in love with the same woman at both ages. The elder had, after all, learned all that the younger could only begin to imagine." Once again, the amazing Bennet Wardrobe proved to be the schoolmaster. Tom Bennet’s lesson? Mrs. Bennet had been formed especially for him. Now, in The Avenger, the Bennet Wardrobe emerges into its own as a lead character: one with a greater purpose than simply being a teacher or a city bus. The cabinet does need to instruct Bennets in that which they need so they can play the role it wants in the greater arc of the entire Series. Readers are introduced to the forces which power the Wardrobe…C.S. Lewis’ Fourth Love—agape; Jacobson’s Fifth Love—exagoras agapis, the love which redeems; and Sixth Loves—Synchotikí agape, the love which forgives. The Avenger: Thomas Bennet and a Father’s Lament is the third volume of the Bennet Wardrobe series and chronicles Mr. and Mrs. Bennet’s journey through the Wardrobe to visit their daughter, the Countess of Matlock, in her own where/when. This novel is about 131,000 words in length. To ask other readers questions about The Avenger, please sign up. The end of the previous book left me grieving a loss and a villain exacting his revenge and seemingly winning. I did not have an inkling how the Five Families would get something of their own back and stop a great danger, but have seen enough surprising and enchanting twists to the series that I didn't speculate long and settled in for this latest installment of a riveting magical time travel family saga. The Avenger: Thomas Bennet and a Father's Lament is book six in an ongoing series. It twists The end of the previous book left me grieving a loss and a villain exacting his revenge and seemingly winning. I did not have an inkling how the Five Families would get something of their own back and stop a great danger, but have seen enough surprising and enchanting twists to the series that I didn't speculate long and settled in for this latest installment of a riveting magical time travel family saga. The Avenger: Thomas Bennet and a Father's Lament is book six in an ongoing series. It twists around and through, leaps forward and back and very rarely stays on a linear path because it involves time travel, but it does have to be enjoyed in order for much of it to make sense. This book was at its heart a second chance tale for a couple in the autumn of their lives to not just rekindle the romance of their youth, but discover a love for the people they are now. At the same time, they are presented with a grand adventure that is driven by the grief of losing a beloved child. The majority of the story is set in post-WWII era Britain and it was a delight to encounter new members of the extended clan such as a couple of former spies who get a little side romance and to also encounter some real life figures interwoven into the tale. The Avenger opens on a dark, gritty note exposing the horrors of Nazi SS torture and the way a captured individual can be broken and just what spies risked when they worked in constant danger for the sake of their country. It also establishes the character of the central villain and the frenzy to track him down. There are moments when I felt the story lagged in extra explanations and details, but the history buff side of my mind could appreciate the pause in the plot to dwell on some of it. This book altered some of the rules from the earlier worldbuilding around the Wardrobe making the wardrobe itself something of an enigmatic figure that is brought to light throughout the additional background and detail. There is a fun twist with all that and those passages of explanation were needed so the reader isn't thoroughly confused. At the heart of these books is the family group who are close and loyal, who do their duty and sacrifice for others. I enjoy when the family comes together for family dinners or a ball, but also to take down an enemy who is set on evil. Mr Jacobson again wows the reader with another magnificent episode in the Wardrobe series. I remember once being impressed by the way movie makers wove their Forrest Gump character through so many major events in the 20th century, but that was small potatoes. Don Jacobsen takes the art to a new dimension, weaving a tale that spans several generations of Five Families, all of whom possess a unique gift: the ability to live and travel in more than one plane. The social responsibility of such a pow Mr Jacobson again wows the reader with another magnificent episode in the Wardrobe series. I remember once being impressed by the way movie makers wove their Forrest Gump character through so many major events in the 20th century, but that was small potatoes. Don Jacobsen takes the art to a new dimension, weaving a tale that spans several generations of Five Families, all of whom possess a unique gift: the ability to live and travel in more than one plane. The social responsibility of such a power, the deep family love carried throughout, and the unique new twists this means for each person’s character development make this a tale not to be missed. Unpredictable, emotional, and unforgettable. Don Jacobson has a special sensitivity for Mr Bennet that I have not encountered before. I believe this is what a male author can bring to this character—a deep understanding of what it is to be a father, and a unique burden for his children,and most particularly for his wife. I enjoyed the chance to peek through his glasses and see Mrs Bennet with new eyes. Highly recommend this series, and I hope there will be more! Like a powerful symphonic compilation, the Bennet Wardrobe, Volume 6 continues to ebb and flow with an intense, gritty, and at times, heart-wrenching tale of forgiveness and redemptive love. I was completely captivated and immersed in the journey of Mr. and Mrs. Bennet as they each face their fears and t Like a powerful symphonic compilation, the Bennet Wardrobe, Volume 6 continues to ebb and flow with an intense, gritty, and at times, heart-wrenching tale of forgiveness and redemptive love. I was completely captivated and immersed in the journey of Mr. and Mrs. Bennet as they each face their fears and their faults head on. How they come together as a whole with the 'help' of 'The Wardrobe' left me in awe. The forces of 'The Wardrobe' come into play in this sixth volume even more. Deciding to finally take his wife to visit their daughter, Kitty, Mr. Bennet needs to use 'The Wardrobe' without Mrs. Bennet knowledge (she believes Kitty is in Cornwall). However, 'The Wardrobe' doesn't necessarily give you what you want, but what you need. Wrongs need to be righted and wounds need to heal. I highly recommend this unique and imaginative saga. There is an intimacy within the pages that you feel a part of. History is woven seamlessly throughout and old and new characters are so three dimensional that you feel they truly do exist. This compelling, evocative and emotive novel had my heart pounding. I cried, chuckled and softly smiled for in the end, forgiveness offers the power of redemption. God Bless Mrs. Bennet! I absolutely adored her! Also, I would like to note that Janet Taylor did an amazing job on the book cover. I highly recommend you read this series in order to truly appreciate the complexity of 'The Wardrobe'. I looked forward to reading this book, and I was not disappointed. There's much history woven into the novel, so going back and forth from novel to explanation is worth the effort. Kitty's death is avenged, but there are losses to the members of the Five Families. Happy reading! Time traveling and a very interesting intrigue. Thoroughly enjoyable plot. I never thought that Mrs. Bennet could be this profound individual. A hard to put down tale. Don Jacobson has written professionally for forty years. His output has ranged from news and features to advertising, television and radio. His work has been nominated for Emmys and other awards. He has previously published five books, all non-fiction. He now exclusively writes Regency Romance fiction. 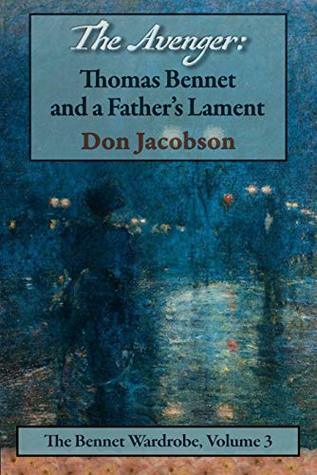 In 2016, he published The Keeper: Mary Bennet’s Extraordinary Journey which began the Bennet War Don Jacobson has written professionally for forty years. His output has ranged from news and features to advertising, television and radio. His work has been nominated for Emmys and other awards. He has previously published five books, all non-fiction. He now exclusively writes Regency Romance fiction. In 2016, he published The Keeper: Mary Bennet’s Extraordinary Journey which began the Bennet Wardrobe saga. In 2018, he also published Lessers and Betters a novel length Pride and Prejudice variation which contains the paired novellas Of Fortune's Reversal and The Maid and The Footman. These two works examine the same event (the mysterious attack on Kitty Bennet in Hyde Park on Guy Fawkes Day 1815) from two different perspectives: that of the gentry and that of the servants. Hacobson holds an advanced degree in History with a specialty in American Foreign Relations. As a college instructor, Don teaches United States History, World History, the History of Western Civilization and Research Writing. He is a member of the Jane Austen Society of Puget Sound (JASNA). He is also a member of the Regency Romance writers' collective Austen Authors. He lives in the Las Vegas, NV with his wife and co-author, Pam ( Roadcookin': A long-haul driver's guide to healthy eating), a woman Ms. Austen would have been hard-pressed to categorize, and their rather assertive four-and-twenty pound cat, Bear. Besides thoroughly immersing himself in the JAFF world, Don also enjoys cooking (Poulet au vinaigre is a particular favorite), dining out, fine wine and well aged scotch whiskey (Glenmorangie 18 Year Old single malt--the water of life).